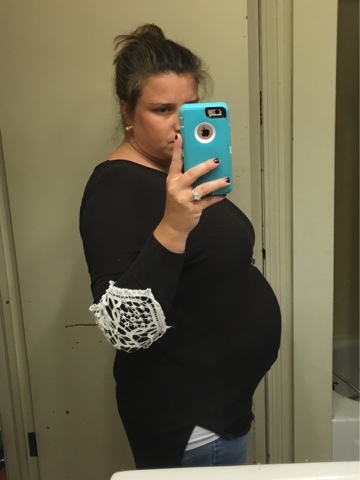 Maternity Clothes: Pants, yes. Tops, some. The pants are just way more comfortable. Movement: She's moving more and more now. She's more active at night which makes sense, none of us are morning people. Sleep: Not terrible, just not getting enough of it lately. What I miss: Order in my house. My house is a disaster mainly because we've been busy at work and sick and I just have no energy to get anything done when I get home. I miss doing things without getting tired or needing help. Cravings: None this week. Still thinking about the filet I didn't eat at the beach. Symptoms: Reflux is much better thanks to the meds. No energy. I guess that's really it. Best Moment this week: Feeling her move more and more. Some dresses I ordered for her came in and they are so cute. I didn't get anything done in her nursery like I'd hoped but it'll all get done eventually. Hopefully. I got the maternity pictures back that a friend took at the beach and I love them so much. I can't wait to have some of them printed. They are exactly what I wanted. I'm hoping to share some here soon.